Last week’s post on 2015 British Columbia property taxes was shared with the “Maple Ridge Council Watch” Facebook group, and there were comments on that site about gaps in my presentation. I’ll point out again that there’s no magic lens to provide clarity on the property tax situation. The system is complicated, and the question of whether you or I are receiving value or fair treatment will always be open to debate. An obvious point missed last week: the property tax system takes no account of income. Individually, wealthy people often own valuable properties; but in a fast-changing market like ours, many ordinary homes have become valuable, and people on modest or fixed incomes must choose between paying very high taxes or moving away from their communities. On the other hand, someone like myself who lives in a two-income household with no kids gets a very good deal, with police protection, fire protection, transit, well-maintained streets and many other benefits for less than the household cost of car insurance. I also pay schooling and recreation costs for other people’s children, and I’m prepared to do that. City by city, the correlation in B.C.’s Lower Mainland between average household incomes and property taxes is uncertain, with Maple Ridge (for example) having relatively high household incomes and relatively low property taxes. Vancouver and Richmond have lower average incomes and higher taxes — although what does “average” mean in the City of Vancouver, which has large populations of both low-income renters and high-income homeowners? The federal government used to publish household income information on a local basis in its StatsCan Community Profiles, but 2006 is the latest online census year for this free service. 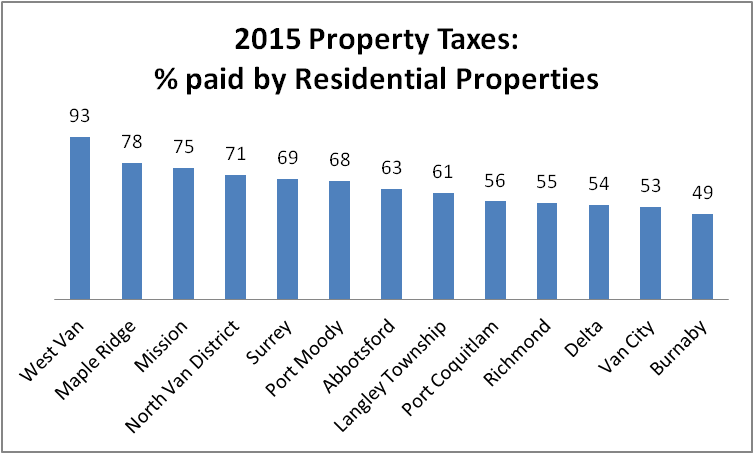 The graph below looks at the property taxes “per representative house” in the municipalities grouped around my home town of Maple Ridge. This takes in municipal, school and regional taxes. Some people would say it shows the system is working: the owner of the representative or ordinary house is paying roughly the same tax in every jurisdiction. Others might argue that taxes should come down as property values come down, although the truth is that many local government operating costs — the cost of a police officer, a teacher or a ton of gravel — are the same wherever you go, regardless of property values. The numbers come from the Government of B.C.’s online tax data. One respondent to last week’s post asked about how the residential share of the total tax burden changes from city to city. This figure varies from 49 per cent in Burnaby, with its abundance of industrial and commercial activity, to 78 per cent in business-starved Maple Ridge, to 93 per cent in the super-affluent District of West Vancouver. Maple Ridge and Mission make an interesting comparison. They’re located side by side, Maple Ridge in the Metro Vancouver regional jurisdiction and Mission in the Fraser Valley. In the 2014 local elections, both cities turfed their sitting mayors with a vengeance, where the typical choice across the Metro Vancouver-Fraser Valley region was to re-elect the incumbent. Both mayors who were turfed had previously driven out sitting mayors, a pattern that suggests ongoing dissatisfaction among residents. 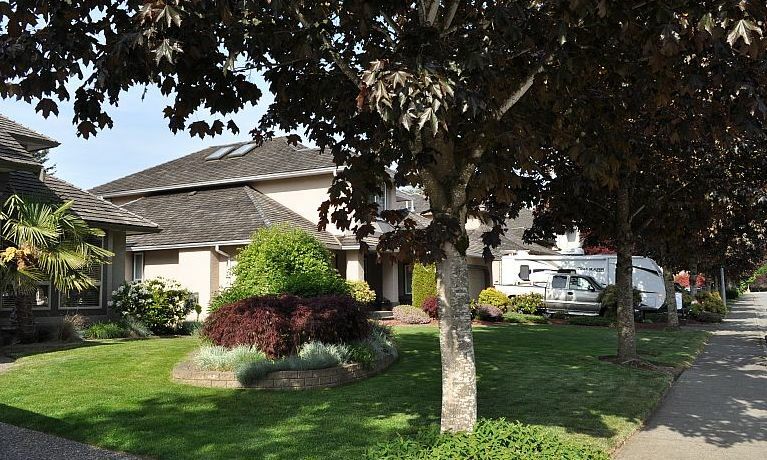 One Facebook response to last week’s post stated that Maple Ridge homeowners pay waaaaaaay more taxes than their Mission counterparts. The “tax comparisons” chart above doesn’t bear that out. 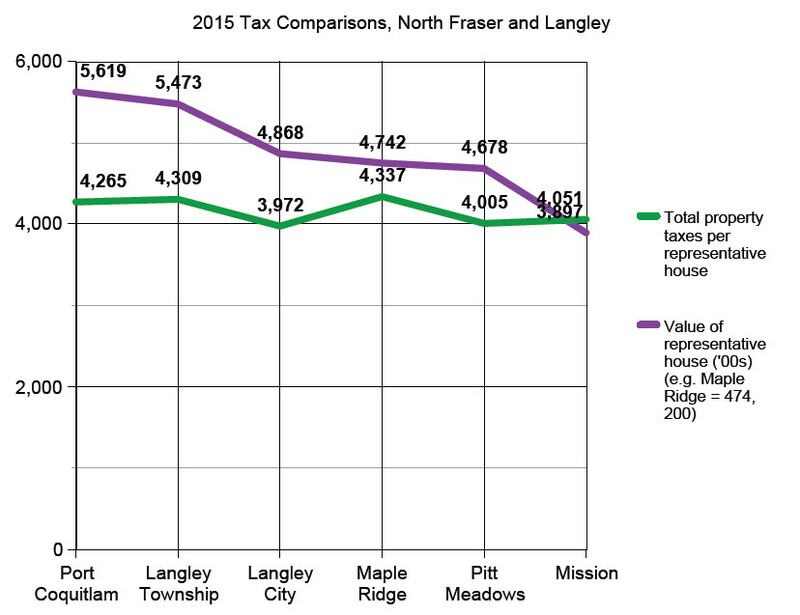 Maple Ridge municipal taxes for each thousand dollars in residential value are in fact lower than Mission’s; when you add in school and regional costs, the Maple Ridge assessments are modestly higher. A big part of this is the Greater Vancouver transit and transportation assessment, which pays for Maple Ridge’s fairish bus service and half the financing costs on the Golden Ears crossing of the Fraser River. In choosing between Maple Ridge and Mission as places to live, I would see property taxes as a minor consideration for most people. Mission has lower housing costs. Maple Ridge has more complete hospital services. 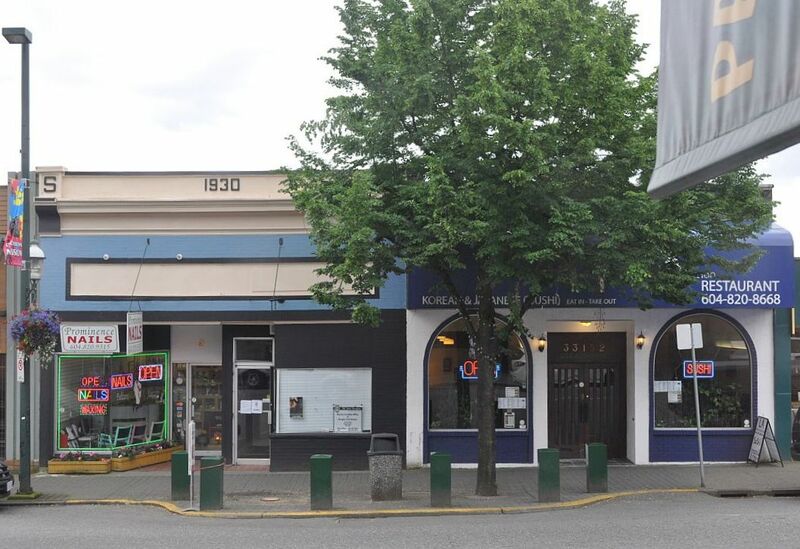 Maple Ridge has a more complete town centre, for those who care. This includes a nice civic complex with a recreation centre, a big library and an arts centre, all part of a controversial development project that triggered the ejection of at least two sitting mayors in the early 2000s. Maple Ridge has more visible homelessness and begging. Household transportation costs may be higher or lower, depending on where you want to go. Both cities sit at the edge of their regions, and both are struggling to attract business, industry or any kind of major employer.